A nice cup of hot tea equals relaxation for me and is a wonderful part of my day when I want to unwind. I first learned about Rooibos tea when I was pregnant with my son and my doctor recommended I drink it for my severe morning sickness. So began my love affair with Rooibos tea. 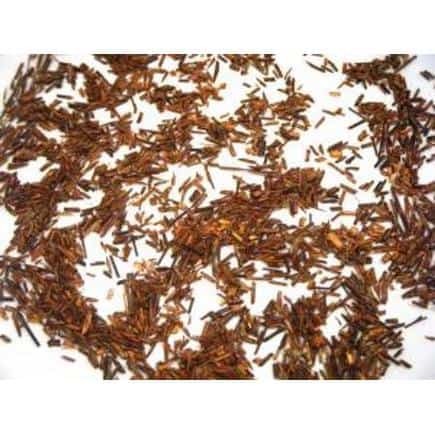 Grown in South Africa, Rooibos tea has been used for centuries by native women to calm their colicky babies. It is 100% caffeine free and has “some of the highest known levels of anti-aging properties on earth”. It has a natural sweetness and is the only hot tea that I don’t add sweetener. My favorite part of drinking Rooibos tea is that it has the most amazing earthy flavor with absolutely no bitterness. It is delicious as both a hot or iced tea. Cha Cha Tea has some of the best Rooibos tea that I have ever tasted. Cha Cha Tea is fair trade certified and organic using natural ingredients and natural essential oils. My kids and I decided to have a tea party and sample an assortment of Cha Cha Teas. My favorite is the Organic Caramel Rooibos. This would be an excellent tea to satisfy your sweet tooth, especially if you are dieting and are craving something creamy and sweet. My kids loved the fresh minty taste of the Organic Peppermint Rooibos over ice. My husband reluctantly joined our tea party but was willing once he tried the Organic Passionfruit Rooibos. He described it as “like a juicy fruit exploding in your mouth.” He drank his over ice and lightly sweetened with Stevia. The next morning, instead of my usual coffee, I drank two cups of Organic Cha Cha Chai tea which is black tea infused with the most delightful spices. The smell of brewing tea and spices spread throughout the house and was really nice for a fall morning. Cha Cha Tea offers exceptional teas for such an affordable value. One trick that I learned with Rooibos tea is that the leaves can be brewed more than one time and still is rich in taste and minerals.